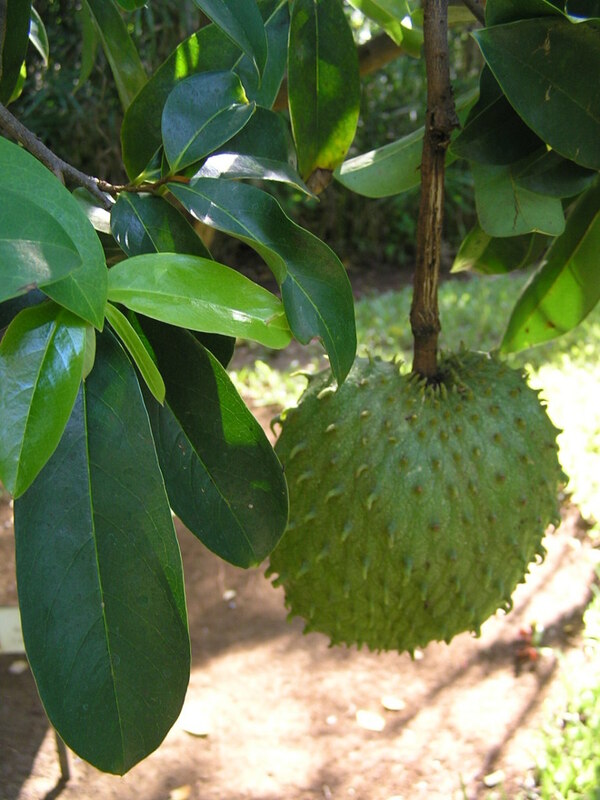 Soursop is the fruit of the tree Annona muricata. 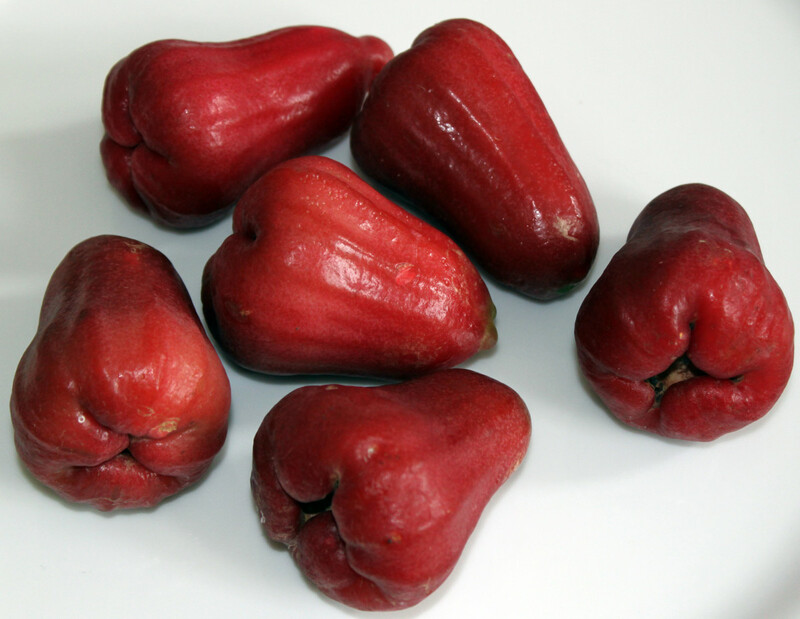 Also known by other names including graviola, guanabana, anona, sirsak and adunu. In India, soursop is known as Lakshmana Phala and Shul-ram-fal. 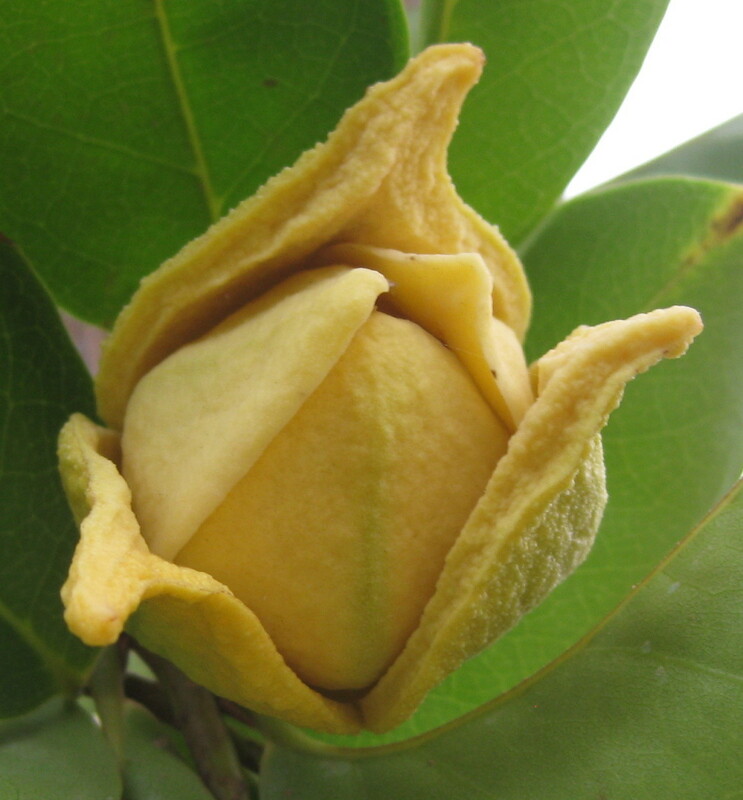 The graviola fruit is a very strange looking fruuit having a contrasting mix of flavors of many fruits. 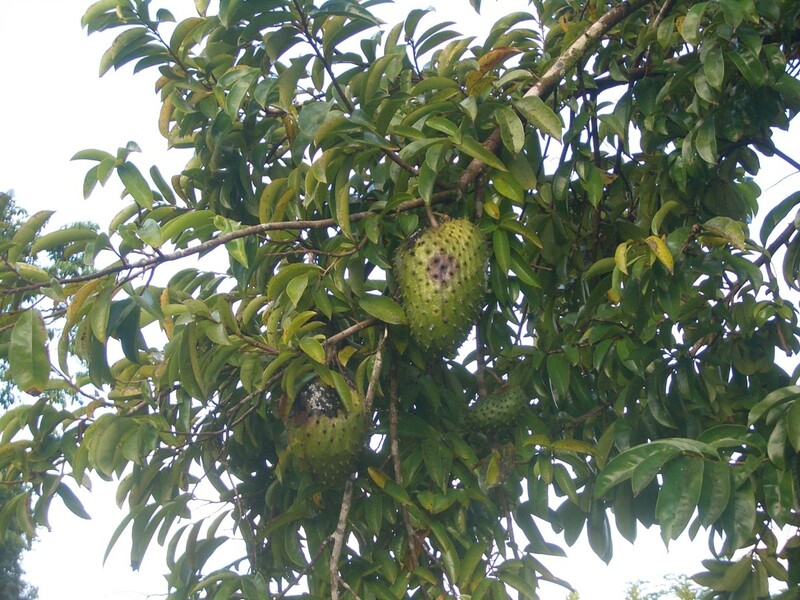 Soursop has been touted as an alternative treatment for cancer. The Soursop tree is a small tropical tree that is believed to be native to the Caribbean, Central America, Northern South America, Cuba and Mexico. It grows to about a height of 30 feet. The Annona muricata grows best and produces fruit of high quality in areas where humidity is high and winters are not severe but warmer. as temperature below 41 degrees F damages the leaves while below 37 degrees F is fatal to both the tree and the fruit. The tree is mainly grown for its fruit, which can grow quite heavy sometimes weighing as much as 15 pounds. The leaves, stem and seeds have been traditionally used for medicinal purposes. 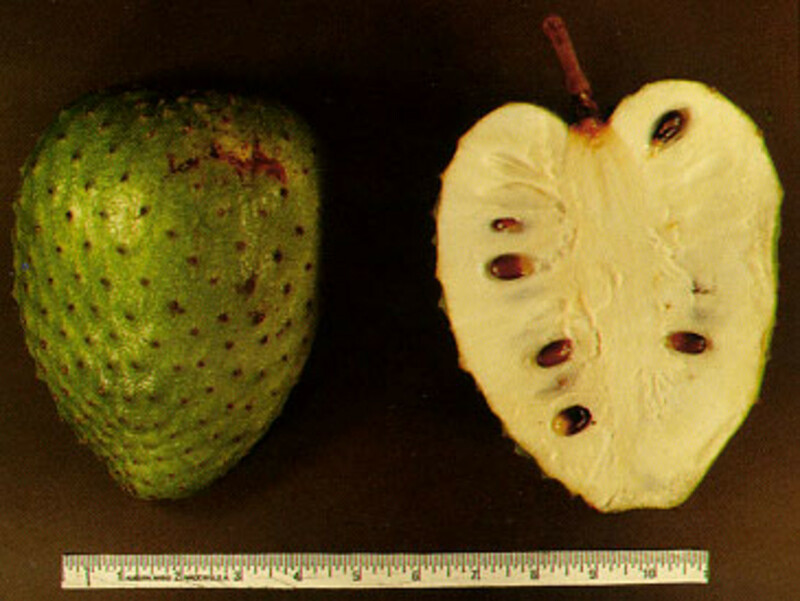 The soursop fruit grows in a variety of shapes. 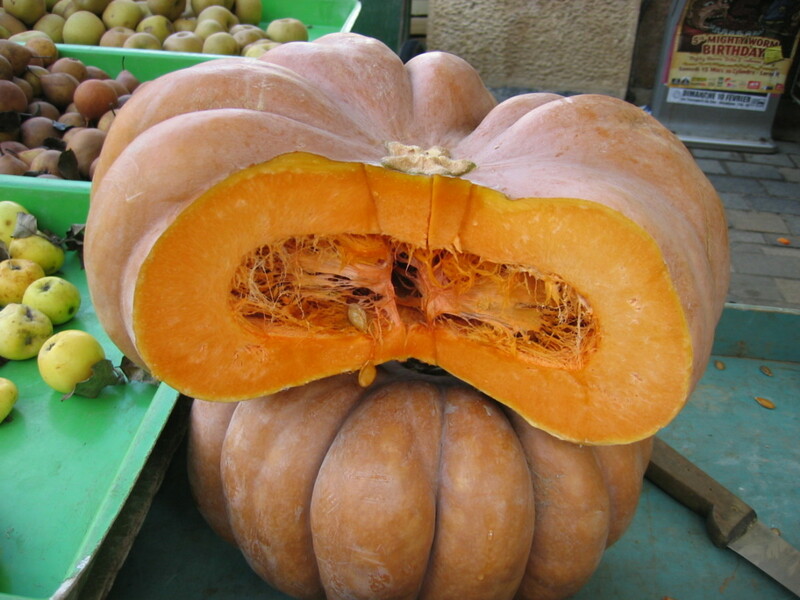 Though the fruit on an average weighs from 400 to 800 grams, the heaviest ones may weigh close to 7 kilos. The fruit length varies from 5 to 10 inches. 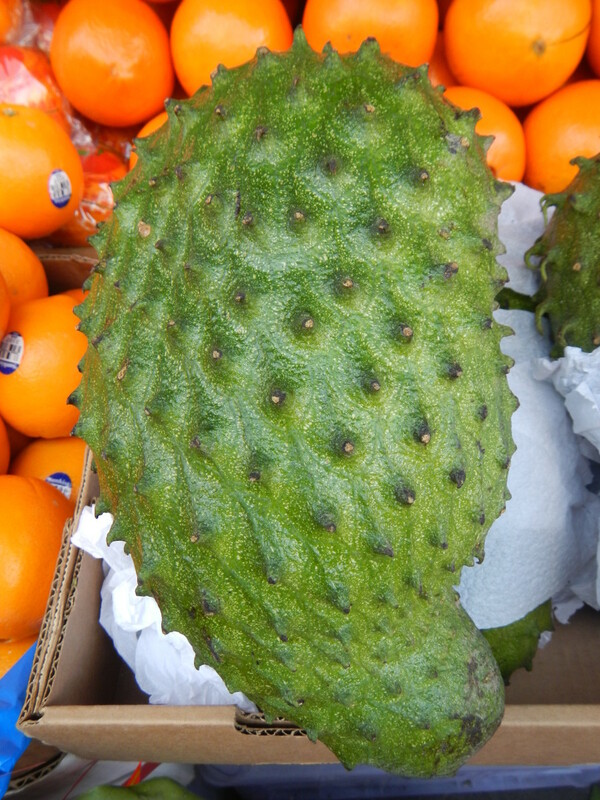 The skin of soursop is spiky and green. It can be eaten raw like any other fruit and can also be processed to make products like smoothies, juices, ice creams, etc. In fact, it is also used to make a variety of food and beverage products. 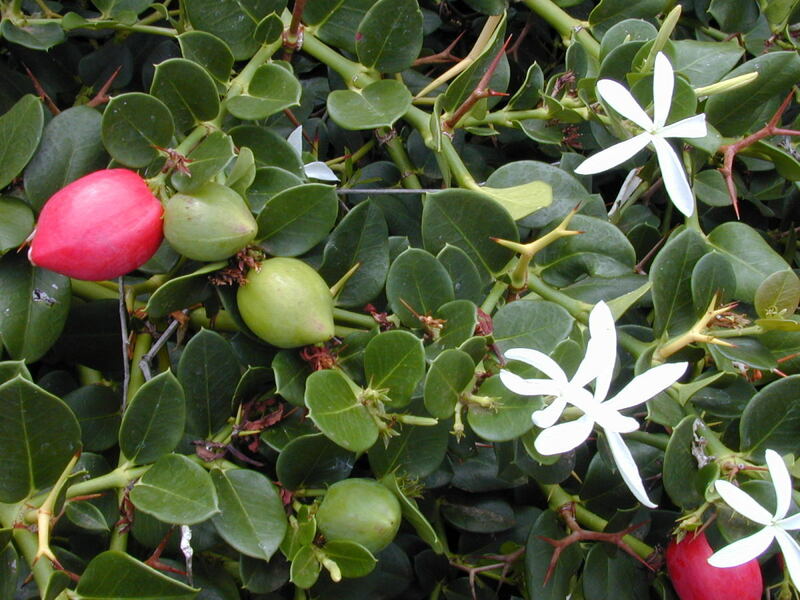 The fruit is also used as and to make medicine. 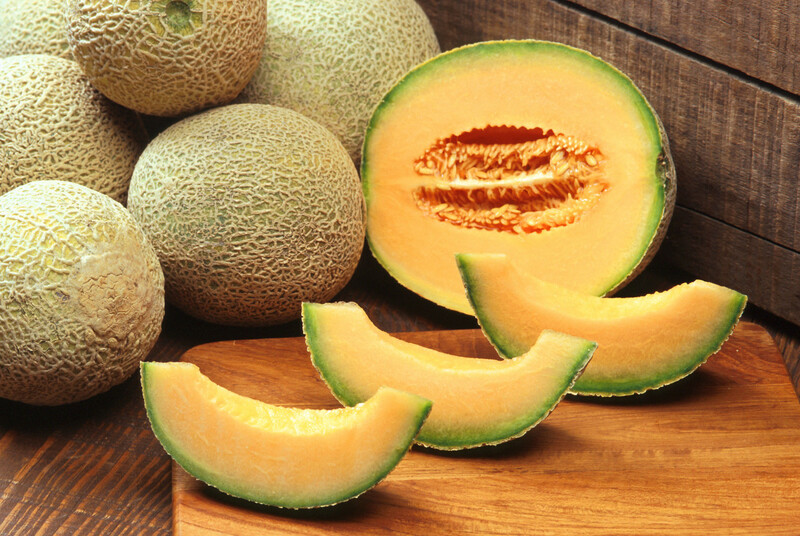 Rich in vitamin C, phosphorus and calcium. Low in sodium but high in potassium. Individual levels of the various nutrients can be seen in the table below. 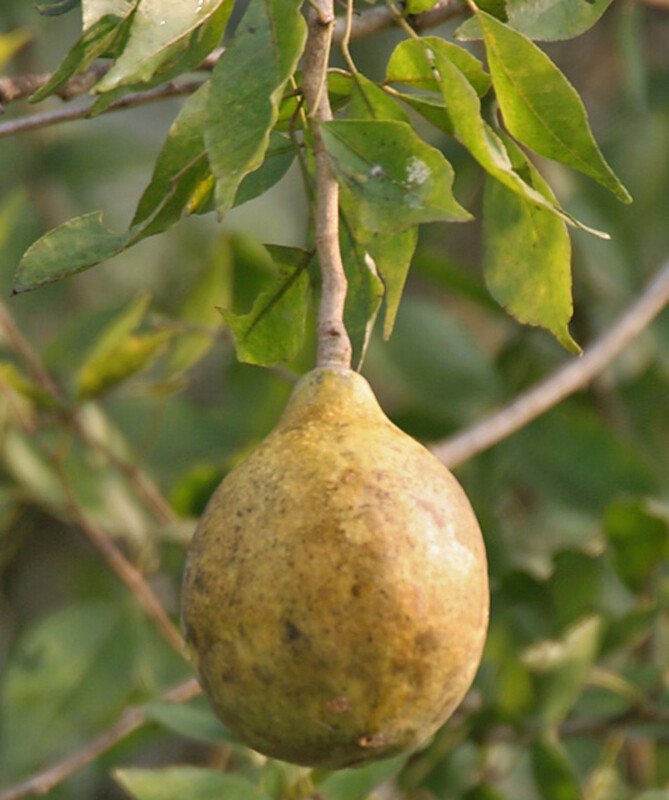 The fruit seeds are used to control vomiting. The leaves help in treating skin affections when applied as a poultice. The fruit pulp helps to heal wounds faster when applied on them. The root bark is used as an antidote for poisoning. A decoction or tea made of leaves is used to get rid of head lice and bed bugs. In the Caribbean, soursop leaves are commonly used as a remedy for insomnia by brewing them to make a beverage. In fact, the leaves used in a pillowcase have been found to promote sleep. Antileishmanial - Leishmaniasis is a disease which causes skin ulcers and affects orans like spleen and liver as well and is caused by the protozoa Leishmania which is spread by some types of sandflies. Cytotoxic - Causes death of certain types of cells since it is toxic to those cells. This property could be used to target specific types of cells like cancer cells. Antinociceptive - Reduces sensitivity to painful stimuli. Research has shown that soursop is able to kill almost 12 types of cancer cells including those of the colon, breast, lung, pancreas and the prostate. 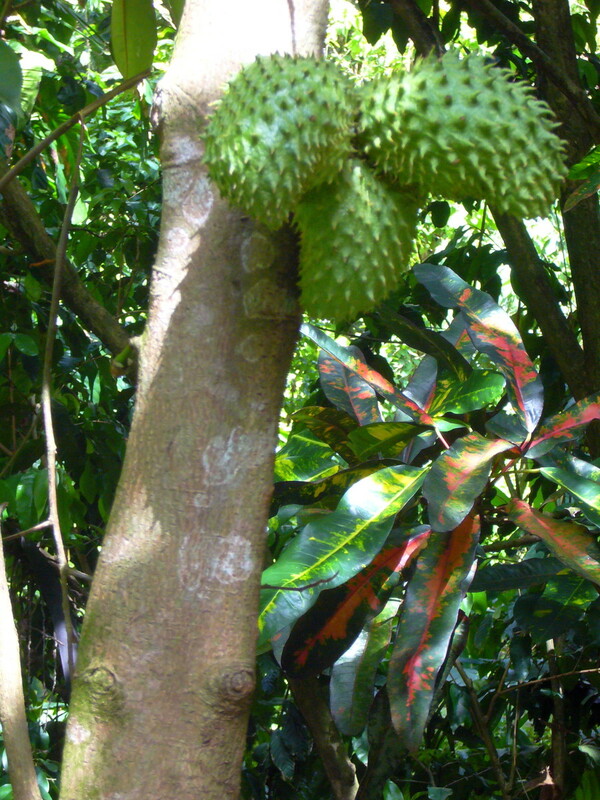 It has been found, in vito studies, that the compound, cis annonacin in soursop, seeds is up to 10000 times more effective in reducing growth of colon cancer cells than the commonly used chemotherapeutic drug Adriamycin. More importantly, this compound kills selectively the cancer cells while leaving the healthy cells unharmed. Human studies though, have not been done on the anti cancer effects of soursop. The bottom line then being that though soursop holds promise as an anti cancer agent, in the absence of human studies and the possibility of side effects soursop extracts need to be used with caution. These extracts should not be taken as a standalone anticancer treatment. Anticonvulsant, antifungal, antimutagenic, antispasmodic, antioxidant, sedative, uterine stimulant and vasodilator. Soursop or graviola may cause movement disorders/symptoms similar to that encountered in Parkinson's disease and thus worsen these symptoms. 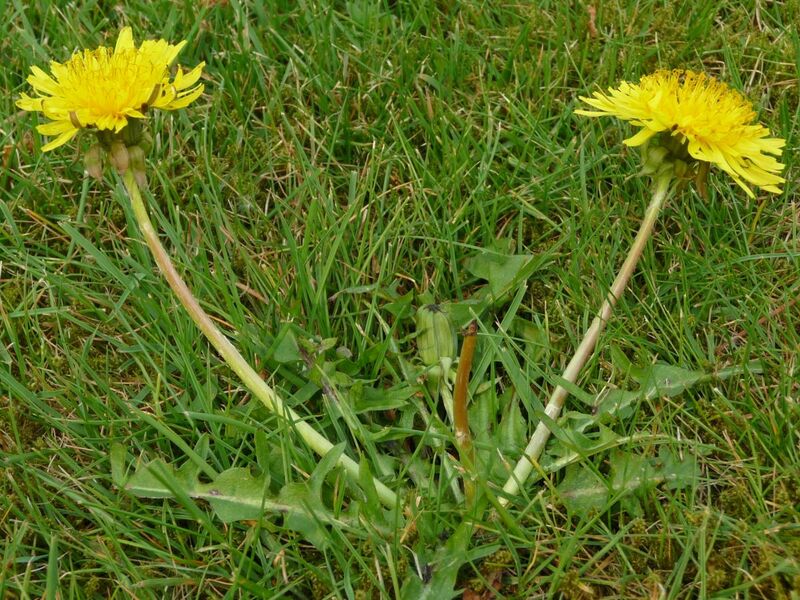 Web MD lists graviola as unsafe since it can kill nerve cells in the brain as well as in the body. Pregnant women and those breastfeeding should avoid it. Graviola lowers BP. Hence, those with low BP or on blood pressure lowering medications should keep this fact in mind. Avoid taking soursop with Coenzyme Q10 or other supplements that increase ATP. 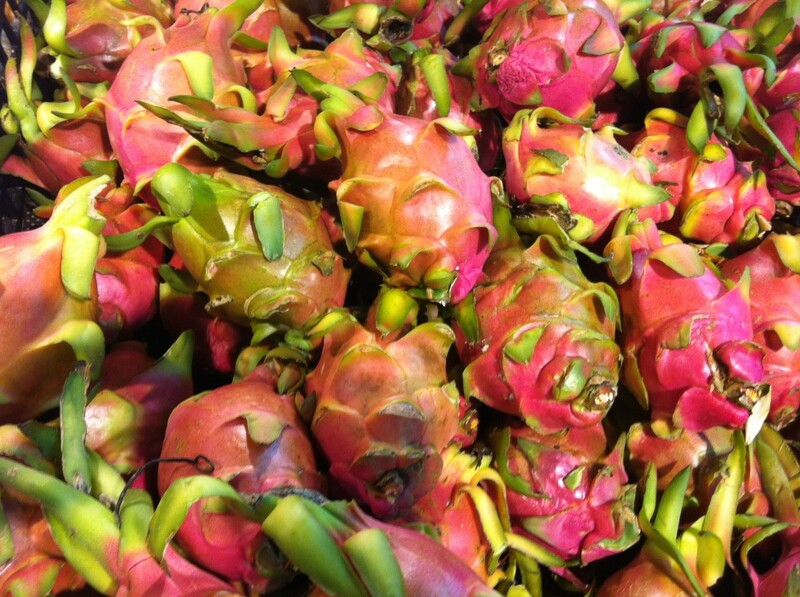 What Is Water Chestnut, Water Caltrop Or Singhara And What Are Its Health Benefits? @Thanks Thish. glad you found the info you needed. Thanks for passing on the link. @ aesta. You are welcome. hope the info helps. Thanks. I have always heard of the health benefits of this fruit but I had been ignorant of its negative effects. Thanks for the information. Very well informative article. I get rarely this fruit as it is not available most of the times in the store. . Did not know it is available in Amazon in different formats. Thanks again. I will share this link with my friends. Thanks for your input, Precy! I appreciate your stopping by and sharing of this hub. I enjoyed eating this fruit Rajan. :) Back in the Philippines, neighbors with a tree shares a ripe soursop or guyabano as we call it. And we have a tree too back then. But here in US, it's expensive and sold frozen. Shared and up! Thanks for stopping by, Monis Mas and appreciate your votes. Voted Up, Interesting and Useful! I have never heard of it, thanks so much for sharing this info. @Susan Recipes - thanks and nice to see you. @MsDora - I'm sure it tastes great as well. Thanks for stopping by. @Eiddwen - thank you and it is always good to see you. @FlourishAnyway - thanks and it's my pleasure providing new information. @AudreyHowitt - thank you for reading and appreciating. Useful--I had never heard about this fruit before! I have never heard of this fruit and enjoyed learning about it. Very informative! You are an endless source of interesting facts and each one so interesting. Great work and wishing you a wonderful day. Soursop smoothie is my favorite. When I'm in the Caribbean, the soursop is one of the most treasured fruits anyone can give to me. Thank you for the nutritional information. I have never seen this fruit. I am glad to read your hubs as I learn so many new things. Thanks rajan for sharing this. Voted up. @DDE - Thanks for stopping by, Devika. @vespawoolf - the fruit is safe albeit. Appreciate your comments and visit. We have guanabana here in Peru. I've heard the claims about cancer and I suppose if I had cancer I would probably try it, but the contraindications are too risky for a healthy person, in my opinion. Thank you for sharing both sides of the story. An interesting and informative hub. The photos are beautiful and so clear . The video added makes all the difference and your work is always informative with thorough research skills.